MUSIC: The Waybacks perform with Rebecca Hall & Ken Anderson in the Showcase Lounge of Higher Ground. Tickets: $8 advance/ $10 day of show. Doors open at 7:00, show at 8:00 p.m.
SHOW: NASA Grant Kara Golux performance at the Flynn Theater. For tickets call 802-86-FLYNN. Show begins at 7:30 p.m.
ACTIVTY: Line Dancing at the Harvest Moon Banquet Room in Essex Junction. Tickets: $8.50. From 6:00 to 9:30 p.m.
ACTIVTY: Swing Dancing at the Champlain Club, Burlington. Tickets: $3. 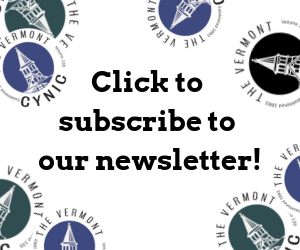 From 7:30 to 9:30 p.m.
LECTURE: Amy Rowe, social anthropologist, talks about the history of the Arabic- speaking immigrants in Vermont. FREE! 7:30 p.m. in the Waterman Memorial Lounge. MUSIC: Aimee Mann performs in the Higher Ground Ballroom with a special acoustic performance by Chuck Prophet. Tickets: $25 advance/ $27 day of show. Doors open at 7:00, show at 8:00 p.m.
MUSIC: Christa Rakich, international prize winning organist, performs in the Music Building Recital Hall. FREE! Show begins at 7:30 p.m.
SHOW: Tap Dogs perform at the Flynn Theater. Tickets: $31/ $41/ $51. Show begins at 7:00 p.m.
SPORTS: Men’s basketball vs. Stony Brook at 7:00 p.m.
ACTIVITY: Israeli Dancing from 7:30 to 10:00 p.m. in Billings Martin Luther King Lounge. ACTIVITY: Book discussion on how Henry David Thoreau’s essay “On Civil Disobedience” influenced Martin Luther King Jr., Mohandas Gandhi and more. FREE! Discussion begins at 7:30 in the Fletcher Free Library. ACTIVITY: Poetry Open Mike night at the Euro Gourmet Market & Caf?© in Burlington. 6:00- 9:00 p.m. Call 859-3467 for more information. SHOW: Comedy Open Mic at Higher Ground. FREE! Doors open at 7:00, show at 8:00 p.m. Contact Lee Seelig at [email protected] if you would like to participate. MUSIC: Open Mic Night at the Rhythm and Brews Coffehouse beginning at 8:00 p.m. in the Fireplace Lounge, Living and Learning Commons. SPORTS: Women’s basketball vs. Stony Book at 7:00 p.m.
ACTIVITY: Valentine’s Dance Party featuring KomboLoko, with free salsa/meringue dance lessons by Salsa Caliente Studio at Higher Ground. Tickets: $15. Doors open at 8:00, show at 9:00 p.m.
MUSIC: P.O.S. featuring Turbo Nemesis with Mac Lethal, SIMS, and Dark Cloud at Higher Ground. Tickets: $8 advance/ $10 day of show. Doors open at 8:00, show at 9:00 p.m.
SHOW: Evelyn Glennie- Percussion performs at the Flynn Theater. Tickets: $30/ $36. Show begins at 8:00 p.m.
SPORTS: Men’s hockey vs. Maine at 7:00 p.m.
ACTIVITY: 11th Annual Winter Is A Drag Ball at Higher Ground. Tickets: $15 advance/ $20 day of show. Doors open at 7:00, Cabaret at 7:30 p.m. followed by two rooms of dancing with DJ Eliot Matos and John Martin. SHOW: Rock Maple Racing SNOCROSS at the Champlain Valley Fair. Tickets: $11 in advance. Gates open at 8:30 a.m., show at 10:00 a.m.
SHOW: Flying Karamazov Brothers- “Life: A Guide for the Perplexed” at the Flynn Theater. Tickets: $26/ $30/ $36. Show begins at 8:00 p.m.
ACTIVITY: Boogie Wonderland: A Family Dance Party at Higher Ground. Tickets: $5 per child/ $12 family pass. 3:00 to 6:00 p.m.
SHOW: Sonia Fleming performs in the Music Building Recital Hall from 3:00 to 4:00 p.m.
SHOW: Carrie Cole performs in the Music Building Recital Hall from 5:00 to 6:00 p.m.
LECTURE: Stephanie Seguino lectures on “Is More Mobility Good? Firm Mobility and the Low Wage- Low Productivty Trap” in room 221, Old Mill.